A wonderful free flowering variety. Clematis 'Negritianka' has stunning plum-purple flowers with a darker purple stripe to each petal with yellow and maroon red centres from July to September. 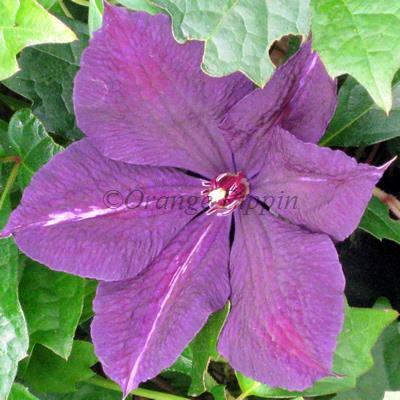 Clematis 'Negritianka' was raised by M. Orlov, Central Republic Botanical Garden of the Ukrainian Academy of Sciences, Kiev, Russia. The name means 'African Girl'. This non-evergreen climber would be best planted against a light background for the colour to stand out most, grown along a fence, garden wall, trellis or can be planted in a container on the patio.